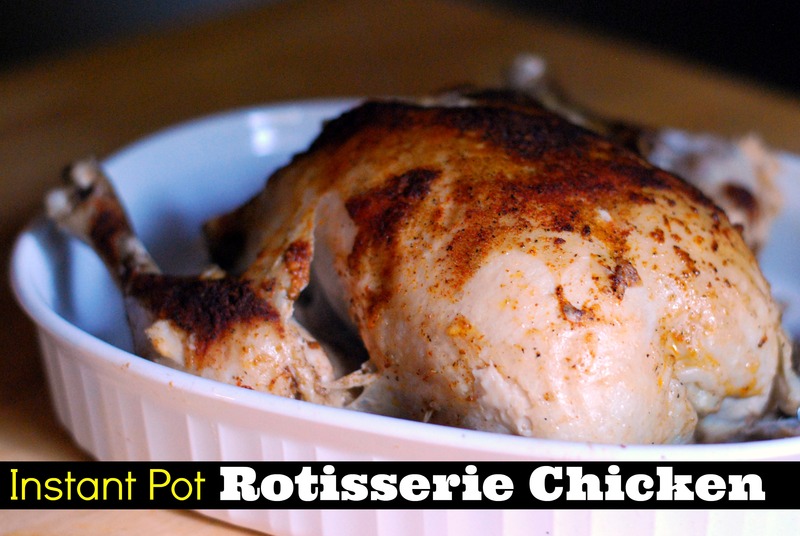 One of the ways I learned to reign in our grocery budget some, years ago, was when I starting cooking a whole chicken at least once a week and using up that meat in casseroles, salads, or sandwiches and then making stock with the leftover carcass. I get way more meat for my money when I roast my own rather than buying the small, sad precooked rotisserie chicken. Since then, I have developed SO many DELICIOUS whole chicken recipes! Click here for more of our favorite Easy Instant Pot Recipes! Remove all parts from the chicken cavity. Rinse chicken inside and out and pat completely dry with some paper towels. Rub chicken down everywhere with mayonnaise. Combine all of the seasonings in a small bowl and sprinkle ALL over the chicken. Place trivet in bottom of the instant pot and pour about a cup of chicken broth inside. Place chicken on the trivet and close the lid. Make sure the valve is SEALED. Set the instant pot to cook on manual for 25 minutes. Once done, let the pot naturally release the pressure for 15 minutes. Remove the lid and very carefully transfer the chicken to a serving dish or to a cutting board like I did to cool before shredding. SAVE THOSE BONES! remove the trivet and throw the carcass back in the instant pot with the juices that are already in the pot. Add 2 large carrots, 3 cloves of garlic, peeled and smashed, a quartered onion, 2 Tablespoons of Apple Cider Vinegar, 2 bay leaves and salt & pepper to taste. Add enough water that the pot is 2/3 of the way full. Close the lid and make sure the vent is sealed. Turn the pot to manual and set the time for 120 minutes. Once done, let the pressure release naturally and strain the broth. Use in soups, casseroles and any other cooking that you would normally use storebought broth for! Enjoy! This is brilliant!! I LOVE this series you are doing with the instant pot! I received an Instant Pot for Christmas but have not yet tried it. I came across your website looking for chicken casserole recipes and found this recipe. I will be trying it this weekend in my Instant Pot! In my instant pot now….will repost!